How can organisations best utilise data to navigate these rapidly changing times? Answering that question does not require us to entertain the successes, failures and potential futures of big data. It simply requires tools and capabilities that enable everybody to notice what busy executives sometimes fail to see. 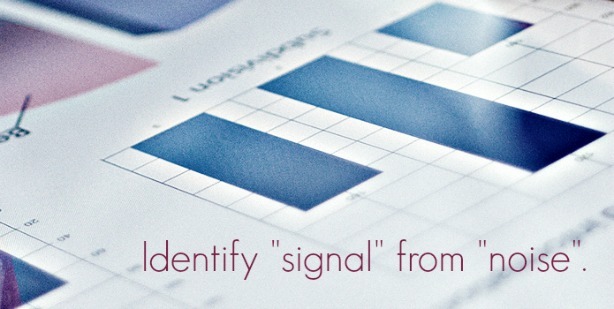 In an article for fcw.com, Cattie and van Riper indicate that for the value of data to be maximised, employees at all levels of the organisation must be able to identify "signal" from "noise". They recommend that everybody in the organisation have "new dashboards, tools and query techniques via channels that include video and classroom training, and ongoing analyst support". We hear a lot about the demand for more data scientists who can make sense of big data. But is everybody else in the organisation being overlooked? Couldn't managers and people at all levels be equipped with the tools and data that create value from smaller data-sets? Maybe some leaders are suffering from HPPO, an acronym Andrew McAfee of the MIT Centre for Digital Business has invented that stands for "Highest Paid Persons Opinion". An executive choice to tackle big data may be delusional, especially if existing data is not put to use in a meaningful way by the people who need it most. The article from fcw.com reminds us that people at all levels may need a bit of coaching in statistical analysis in order to complement executive decisions. Big data presents a greater challenge than most organisations are ready to tackle, yet everybody can use intelligent signals that support smarter decisions. In our G+ Community, David Pidsley (our co-founder) agreed that the support of business intelligence activities inside of tools like Excel (which is used by almost everyone already dealing with expenditure and sales data) is important." He adds that business intelligence "should enable anyone to mix and match the data and the interface that suits their task at that particular time." One might worry that executive leaders are being driven into HPPO-mode by the "big data" hype that proliferates the web. Please tell us that some leaders are empowering their organisations with data tools and capabilities that make sense of today's challenges. We could all use some assurance that we're sailing in the right direction, no?